I just love coming across little bits of history—that aren't so little—in the most unexpected of places. This beauty, a 1916 Glover Machine Works locomotive, is in a parking lot across railroad tracks from the Gone With the Wind Museum and the Marietta Visitors Bureau, and a block away from Glover Park, in downtown Marietta, Georgia. 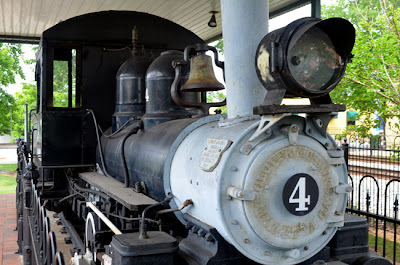 "Built by Glover Machine Works of Marietta, this 1916 locomotive was sold to a company in Va. for hauling lumber. In 1921 GMW reassumed possession. It was restored in 1992. Today GMW is in its sixth generation and still makes heavy industrial products. Begun in 1848 GMW is the oldest family-owned manufacturing industry in Georgia." 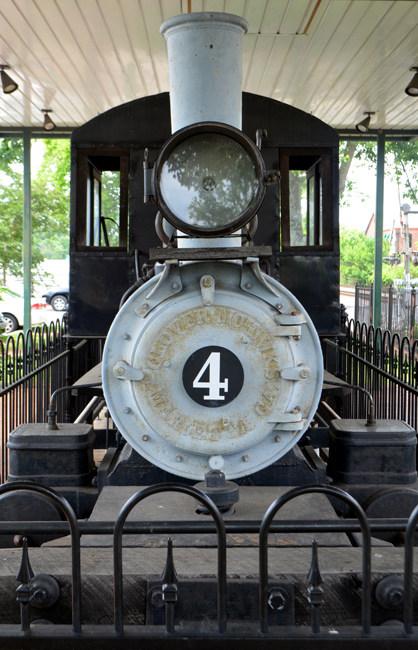 One source says that this locomotive was last for sale in 1931 for the handsome price of $750. 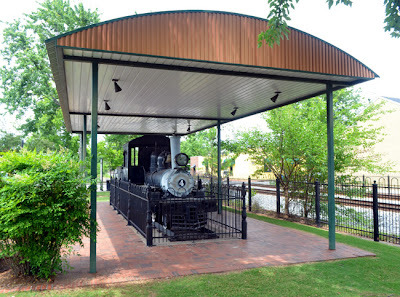 The Southern Museum, in Kennesaw, Georgia, is currently running an exhibition titled, Glover Machine Works: Casting a New South, which features the only fully restored belt-driven locomotive assembly line in the United States. I'm anxious to check out that Museum and the Glover exhibition...sounds fascinating! The cool thing about having this 1916 locomotive in downtown Marietta, is that Glover Machine Works was originally located in Marietta...the company helped industrialize the South after the American Civil War. History is all around...I hope you'll take a moment to explore when you see an historical marker or an artifact on display. You're bound to learn something quite fascinating. ...and the Argentinosaurus said, "Cheeeeeese!"